Morley has been designing and manufacturing pedals since the 1960s. Their range of products includes some of the most revered models of pedals available on the market today. Among these models are the Morley wahs. This article will perform a Morley PFW Cliff Burton Tribute Power Fuzz Wah review. So sit back and enjoy. The wah genre of pedals is dominated by a few names. Among them are the Crybaby/Vox design, which to most veteran players may sound unorthodox and the Ernie Ball design. Both these products are notable wah effect pedals. As much as there are some high-quality wah pedals out there, wacky ones are also present. Some companies have tried hard to manufacture classic design wah pedals, but have failed. The only company that has managed to do this so far is Morley. They have managed to do this with their electro-optical driven expression pedals. 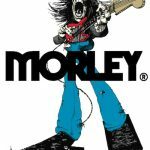 As mentioned earlier, Morley has been in the pedal manufacturing business for quite some time now. Their older pedals have now faded from the market but the ones still going strong are of the electro-optical design. The electro-optical design that the Morley PFW Cliff Burton Tribute Power Fuzz Wah features is pure genius. This pedal works by opening and closing a shutter which determines the amount of light reaching the Light Dependent Resistor (LDR) when you move the pedal from heel to toe. 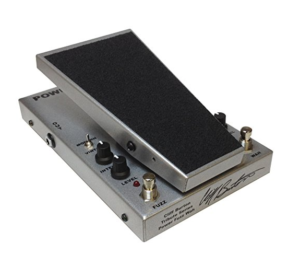 This design is much better than those of other wah pedals because the Morley PFW Cliff Burton does not have a potentiometer, which wears easily. The Morley PFW also features a well-built cold-rolled steel casing that can survive years of hard stomping. It is powered by either a 9V battery or a standard Morley adapter. 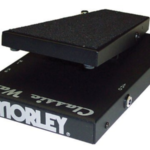 The main issue that most guitarists have with this Morley wah wah pedal is its size. 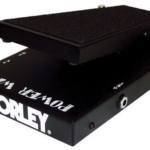 The Morley PFW is quite big for pedals of its class. It measures 9.5 x 6.2 x 2.8 inches and weighs 3.7 pounds. Among the features that make this an impressive wah and fuzz pedal is its switch-less engage design. This means that the treadle of the pedal is spring-loaded. Therefore, when the pedal is idle, the spring returns the treadle back to the heel down position. At this position, the pedal is powered off and in buffered bypass mode. When you press the treadle down, the LED indicator turns on indicating that the wah has been turned on. This feature is quite thoughtful because, with this pedal, you will never fail to engage the pedal at the right point or accidentally leave it on. Another benefit of the treadle being spring loaded is that you can use the wah and fuzz pedal not only as an effect but also as a feature in a tune. The only problem with this feature is there is a minute delay when you switch on the pedal. The Morley PFW also features a built in sweep range. This feature allows a player to adjust the level and frequency of the wah or fuzz effect. This can be done using a switch located on the left side of the PFW. This feature allows you to adjust your wah or fuzz effect from a treble screech, to a ballsy mid-range quack. This pedal offers you more features and options than most other wah pedals available on the market. The Morley PFW pedal blends two essential effects in one unit. These effects are wah and fuzz. You can either run both effects in tandem to achieve a tone that is aggressive or run them independently. The pedal also features a Vintage/Modern toggle. This toggle is useful if you are experimenting with new styles of music because it provides you with extra tonal options. The Morley PFW Cliff Burton Tribute Power Fuzz Wah is an impressive pedal that any serious guitarist should have. It is packed with useful features and the fact that it has two effects in one unit makes it even better. Therefore, make sure you get yourself one.